How do you treat yourself for going an entire month without a takeaway? And you’ve got a rough month ahead so you both really fancy a serious treat meal? 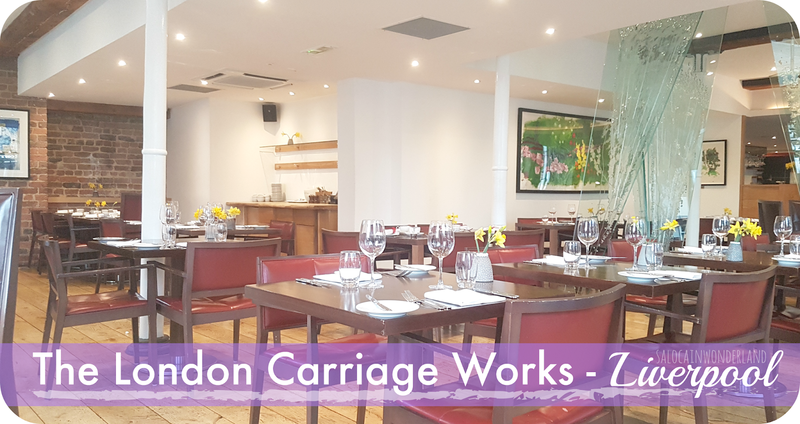 You book yourselves a table at Liverpools London Carriage Works Restaurant. Now that’s what I call a pretty special treat! Attached to the very stylish Hope Street Hotel, The London Carriage Works is a beautiful multi award winning restaurant that specialises in modern British dishes. They use as much local and fresh produce as they can, so it really is a restaurant with a lot of Liverpool thrown in. Right across from Liverpools historic Philharmonic Hall, just down the road from it’s namesake pub, and gorgeous Georgian buildings all around, it’s one of my favourite areas of the city centre! We decided to make it a day of treating ourselves, so we booked in for 1pm on Saturday afternoon. Maybe it’s a January thing but we were there until after 3pm and we had the entire restaurant to ourselves! There was a number of people in the bar and lounge area, but the only other couple in the restaurant left not longer after we sat down. Many of the tables were set up for afternoon tea, but I wasn’t lucky enough to see how good that looked! Though I’ve heard very good things. Does anyone else find slightly fancier restaurants a little intimidating when you’re the only one sitting there? It was a bit strange, that’s for sure! But the wait staff were absolutely lovely, couldn’t do enough for us, but also didn’t bother us every 5 minutes which I was a little worried about being the only diners there. When booking our table online, we had to choose whether we wanted the prix-fixe menu or the a la carte menu. 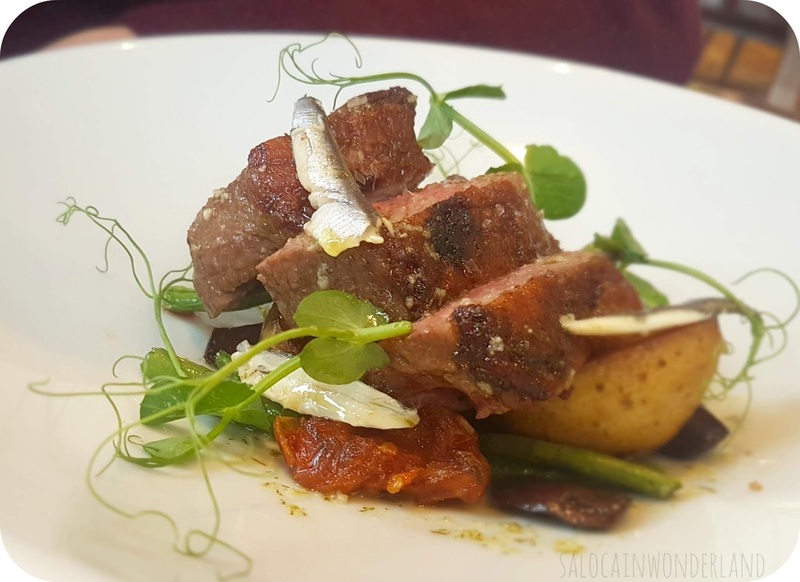 We went for the prix-fixe, with the option to have 3 courses for £29pp. This was the menu we were handed upon arrival, but they also gave us the bar menu which had some slighter bite options we could order from and eat in the main restaurant. The bar menu actually had some really decent offerings for not too bad a price - and not having to sit in the bar to eat them was an unexpected bonus. With a gin garden cocktail on the way, we got to ordering the food. I went for the winter roots, goats cheese bon bon, and toasted pumpkin seeds. 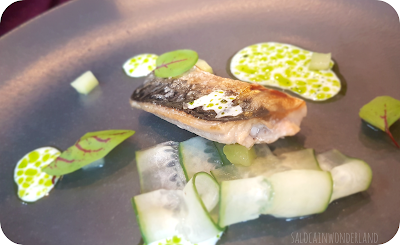 The Mr went for the grilled mackerel, buttermilk, cucumber textures and dill. 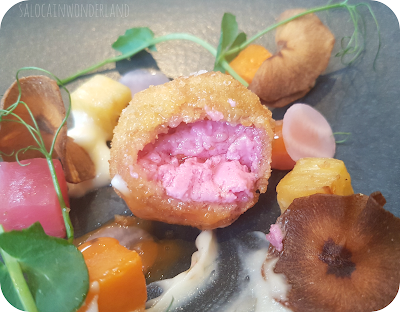 The goats cheese bon bon was pink, and yes, I am that basic. It made me smile. I’m not a massive goats cheese fan, but this was just the right amount were I could enjoy it without it becoming too sickly. Seriously scrumptious and very light. 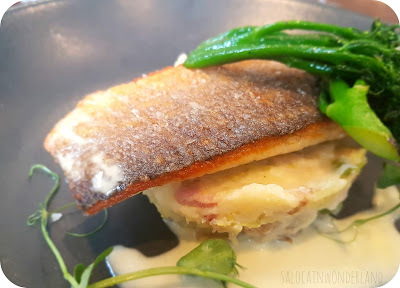 The Mr devoured his mackerel, the buttermilk had some very interesting amoeba like splodges to it, seriously this is why you can’t take us two anywhere haha! He said it was ‘really nice’ which is a lot coming from him! I went for the pan fried sea bass, with bubble and squeak, young broccoli and citrus beurre blank. The Mr went for the lamb rump, new potatoes, sun-dried tomato, olive, green beans and anchovies. I made a mistake. Kind of. I’ve been pescatarian since May 2019. Did I realise the bubble and squeak would come with bacon in? No. No I did not. Yes, I’ve been told thats the traditional way of doing things, but it didn’t even dawn on me. I didn’t complain, it was me who made the mistake by not checking, so I just picked the bacon out. I ate bacon for 30 years, I doubt the tiniest accidental bite is going to kill me now. Bacon-gate aside, the sea bass was absolutely gorgeous. Like seriously, very, very good. It had the crispiest, saltiest skin, and the fish just flaked away underneath. The Mr’s lamb rump looked really good. It had the perfect pink tone running right the way through and his portion size was really hearty. If I was still eating meat, oh damn would that have done down a treat. His comment? ‘really nice’, so you know it was good. When it comes to pudding, the Mr tends to go for some liquid gold, where as am I am a sugar fiend. He ordered his pint of Estrella, I ordered the eaton not so messy. I mean just look at this crispy, beautiful, ready made for a flay-lay dome? That’s some foodie blogger satisfaction right there. 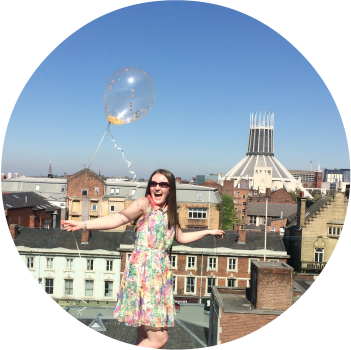 Reluctantly, I took my spoon in hand and cracked into the dome like an overside egg. Seriously satisfying. Filled with mixed berries, on a bed of rich cream, every mouthful was more delectable than the last. It was rich but light and the perfect ending to our meal. Our meal at The London Carriage Works was a real splurge, coming in at just under £100 for 1 cocktail, 2 beers, 2 starters, 2 mains and a dessert. Not forgetting the food was part of a prix-fixe menu so had a set price. The lamb rump came in at an extra £4 supplement. They automatically add a 10% gratuity surcharge onto every bill, regardless of how big or small your party might be. You can ask to have this taken off if you do not wish to pay it, but I do think it’s a bit sneaky for smaller groups. Overall, we had a fantastic dining experience. I am glad we went early, as there was a much more relaxed atmosphere. I would love to go back and give their afternoon tea a try, that would be a lovely treat with the girls! 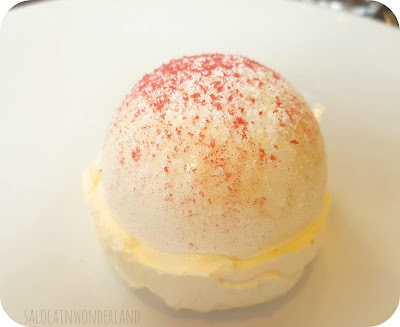 With a seasonal menu that changes often, I’d love to go back at another time and sample the next season delights - well worth skipped a few takeaways to treat ourselves to such a lovely meal if you ask me! Have you dined at The London Carriage Works? I don't think you should worry about the bacon. It is a choice to be pescaterian and you ordered that without realizing it will have bacon in it. If you don't know, then it can hardly be a choice. In my 11+ years of being vegetarian I had some things that weren't veggie because I had no idea how it is made, for example Guiness (now is vegan). I'm just saying this because it happens to almost everybody, so don't worry. The dessert looks fab, that dome is perfect. I'm not too keen on the whole supplement thing though. Glad to see you've had a wonderful time. Ah thank you! Im not going to stress about the bacon-gate too much! It was annoying but it was an honest mistake and now I know for future reference! I'm sure these things will happen again, but it's not worth beating myself up over that's for sure!